I’ve made several changes to the normal dish. For the bread, I’m using Heston Blumenthal’s pizza dough recipe, only slightly modified. You can buy malt syrup here, and Caputo pizza flour here or here (unlike other places that sell you 55 lb, these two repackage the flour into smaller bags). I always find that there’s too much dough, so my version favors the toppings. For the cheese mixture, I think there’s no point in sticking to the letter of the recipe. People in Georgia use whatever cheeses they have access to and like. Living in New York, I have a vast selection to tap from. Instead of buying factory-made sulguni, I prefer my own blend of rustic cheeses, and it doesn’t bother me that none of them are Georgian. I even add some corn purée to the mix. Finally, I use duck eggs instead of chicken eggs because of their richer and larger yolks. If you’re in a hurry, you can scroll to the end to find tips for a quick “Lazy Boris” version! Place the flour in the bowl of an electric mixer fit with the dough hook. Stir the malt syrup into the water, pour into the flour and mix on the lowest speed for 3 minutes. Let rest for 1 hour. Add the yeast and salt, and mix on low speed for 7 minutes. Shape into a ball, wrap in plastic film, and refrigerate for at least 12 hours. Place the flour in the bowl of an electric mixer fit with the dough hook. Stir the malt syrup into the water, pour into the flour and mix on the lowest speed for 4 minutes. Let rest for 1 hour. Add the yeast and salt, and mix on low speed for 4 minutes. Add the pre-ferment, and mix for another 4 minutes. Shape the dough into a log, and cut into 5 pieces. Place the pieces into a dish brushed with oil, cover with oiled plastic wrap, and let rest for 2 hours in a warm place. Place a pan of water at the bottom of an oven, and a pizza stone at mid-level. Heat the oven to a solid 550 F.
In a blender, process the corn, eggs, pepper and half of the feta. Crumble the rest of the feta, add to the mixture, and reserve. Grate the kashkaval and reserve. Drain the mozzarella, slice and reserve. Transfer the bread onto the pizza stone, and bake for 4 minutes. Form a small crater at the center with the back of a spoon, add a duck egg, and season with salt and pepper. Bake for another 3-4 minutes, until nicely colored. Take out of the oven, and let rest for 2-3 minutes. Cover with a couple slices of butter and serve immediately. Making the dough is clearly the most time-consuming part of this recipe. Instead, many places sell good pizza dough, from Motorino to your corner pizza parlor. You can replace the duck eggs with chicken eggs, just discard about half of their whites. I am not sure what the “preferment” is. Is it to be made before the pizza dough, then added to it before letting it rise? That’s right, Cheeselovingalien. The pre-ferment is meant to bring flavor, not volume. It is refrigerated for 12 hours to let the flavors fully develop, and it won’t really rise. 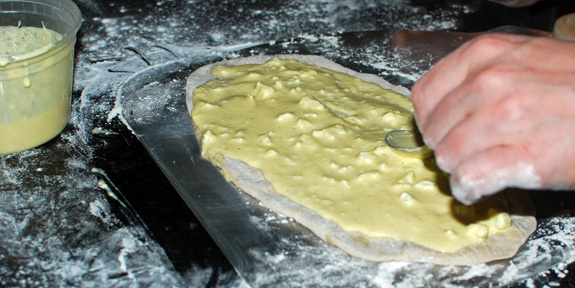 It is then added to a traditional yeast dough. Out of curiosity, what kind of flavour does it add? I’ve been immersing myself in every khachapuri recipe I can get my grubby, cheese-covered (at this stage) hands on, and I’ve never heard of this version before. Also, curious as to why you crank the heat up so high, and thus bake it for such a short period of time. … Is this to make it crispy, to keep it from rising too much, cuz you want to eat it sooner, or some other reason? Hi Jordan, the corn adds… corn flavor 🙂 Corn and cheese go really together (think of Mexican street corn). I crank up the heat so high because the Adjaran khachapuri is similar to a pizza in many ways, and baking a good pizza requires the highest heat you can get.